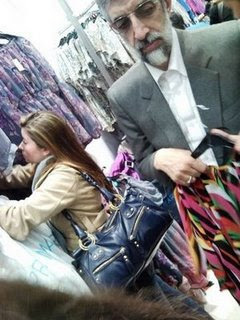 I am not sure when this pictures was taken but it shows Gholam Ali Haddad Adel, shopping in a women's department in London. Haddad Adel was the former speaker of Islamic Consultative Assembly, Majlis. In 2000 Adel received the lowest number of votes to enter the Majlis, but in 2004 when Ahamdinejad became the president, Adel also mysteriously received the most number of votes for the thirty Majlis deputies from Tehran. Haddad Adel's daughter is married to Mojtaba Khameneii, Supreme Leader's son who is the string puller of the current coup to keep Ahmadinejad and his junta in power. Mojtaba wants to become the next Supreme Leader after his father. I am also investigating reports that Ali Kordan visited Lonodn on 11th July this year. The source tells me Kordan's visit was to negotiate the release of Hossein Rassam, UK embassy in Tehran's employee who was detained after the 'election' protests. In return the source tells me the British government agreed to make BBC Persian programs give less coverage to the protests in Iran. Britain has always been host to many repressive figures in the Islamic Republic. This one, Oroumieh's Friday Prayer Leader, Mollah Hassani, even snitched on his dissident Marxist son, which led to his arrest and subsequent execution. Molla Hassani writes about this with much pride in his memoirs. I would hate to know the BBC would stoop so low. Thanks for reporting this. Please juxtapose this surveillance photo of him with the one here as these people need to be outed. UK is going down the toilet. Maybe he just finished trying on that frock in the women's dressing room?